Oceans are composed of microcontinents (see Microcontinent), sim clusters (see Sim Cluster), sim groups (see Sim Group), sims that cannot be grouped (see Unassociated Sims) and remote sims. You can find more about them at the List Of Microcontinents And Sim Clusters. A Grid Sector is a sector of the map. Nobody made a clear map of the oceans. Some names could be found at ContinentDetector. On Earth, we find the boundaries of the oceans to be continents. So, this method can also be used here. It is strange that our world has 10 years and still there is no map of the oceans and no official names. There could be some reasons for that. A comparation of the grid map shows that every year its shape is different. Every day 100 sims are changed  in various ways: new sims are created, sims are deleted, change their name or their position. Even entire private continents are formed or deleted from time to time. Allready, from August to Octomber 2013, new sims appeared in places where there was nothing. Since there are not many suggestions for ocean names, I decided to name them myself. If anybody has a better suggestion, is free to help and improve. Also if the Linden officials son't agree with these names, they are free to delete this article. As far as Octomber 22th, 2013, people suggested me to change some names. and make the naming system more simple. The grid itself changed shape. As required from some residents, the new oceanic borders are much more visible and use larger continents as borders. Also, smaller strucures are included into larger ones. The following maps were created in August 2013. Some of them are outdated. 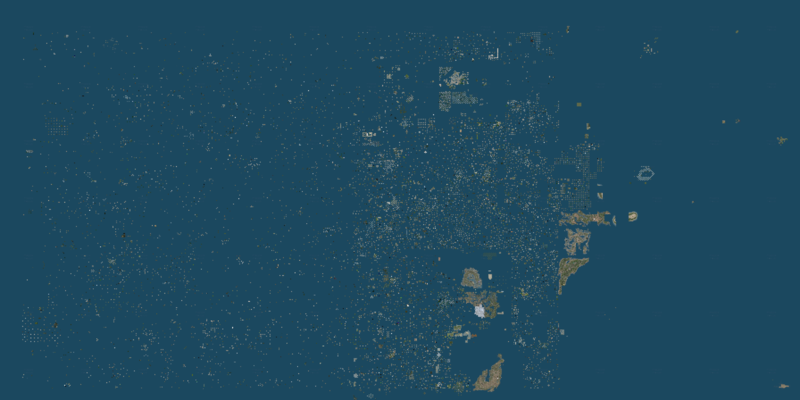 Please, use the links above to get updated maps (Octomber 2013) for every ocean. Older maps showed another sea in South-East, much longer and at a larger distance then the actual Remote South-East Sea. It no longer exists. Also, some private islands existed in the waters around Zindra. This process happen probably not just twice and will also happen in future. The Gridsurvey  shows that in september 1st 2013, the grid has 26830 regions (sims) active. 75141 sims existed from the birth of Second Life until that date, with a historical maximum of about 34000. Remote South East Sea vanished somewhere in September 2013. Incredible, but in February 2014, it came back to life. The space beyond the most remote sims to the border of the grid forms the void ocean. Dimensions are unknown, but it could be about as wide as the populated part of the grid. Grid positon of a sim can be easy deduced with llGetRegionCorner function, These coordinates are used by Gridsurvey . The Da Boom sim in Sansara has the coordinates 1000/1000. First coordinates are for longitude, second for latitude. The most Eastern sims have coordinates starting with 500, the most southern (Premium Sea) with 500, the moth Northern (Remote North Ocean) end up to 1500, while the most Western land (Zindra) has coordinates up to 1800. Suppose the South-East corner of the Void Ocean is at 0/0, the North-West corner should be at 2000/2000 to form a perfect square. Every sim has coordinates. You can get coordinates in 3 ways: with the help of a script, with a tool from marketplace or from Gridsurvey. A script uses the functions llGetRegionCorner or llRequestSimulatorData (the first function is more simple). Tools are in different models and from different merchants. At Gridsurvey, follow this link  and type the name of the sim you want. Anyway, since every sim has coordinates, it's easy to find coordinates for continents and oceans (like in real world). The following coordinates are for each sea and ocean described above. The numbers are : longitude (min - max) / latitude (min - max). Unlike continents, oceans are a lot much larger and their boundaries are not well defined. So, if a sim is at te border of two oceans, it might appear in both. If you like Math, you can compare these numbers with the numbers from List Of Continents (see the links for each continent) and find out how big the oceans really are. All maps of oceans and grid sectors can be downloaded. They are hosted on Mega, the succesor of Megaupload and probably the most secure data host & transfer system. You need google chrome for this. To download, CLICK_HERE. Smaller groups of sims, like a Microcontinent, a Sim Cluster, a Sim Group, an Isolated Sim or Unassociated Sims are shown in the List Of Microcontinents And Sim Clusters. Large groups of sims that can be considered a Continent are shown in the List Of Continents. This page was last modified on 3 February 2014, at 10:17.